Powell’s City of Books in Portland is one of the most well known bookstores in America. It covers a whole block downtown, and I went in there on my first night in Portland and nearly never came out again. Books books books, everything you could think of, I was lost in a literary world (well, in my case more of the non-fiction world, and specifically the language section) as soon as I walked through the door. It’s the sort of place I would probably have spent every day of my teenage years (by the way, I spent almost every day of my teeneage years in bookshops, whenever at all possible). The map of the store is incredible, but in my case I still got hopelessly lost. I just kept seeing things I wanted to read. when I reached the section on languages and found the books on philology I nearly started crying. There were titles I have never seen in a bookshop, just sitting there on a shelf in front of me, saying “Go on, Pete, you know you want to spend the rest of the evening reading about Old English and its Closest Relatives”. I didn’t give into book-buying temptation (mostly because I didn’t want to carry loads of books to the pub with me), so I got a Powell’s pint glass and a couple of t-shirts instead. I did find myself getting sucked into their Star Wars section, got a little sidetracked looking through the maps and travel books, and I passed a good deal of time in their zine and small-press section too. I came back on my last day there to sketch the outside, but ended up getting sucked back in and wandering about its colour-coded sections like a mouse in a cheese shop. Powell’s is the best book store ever. 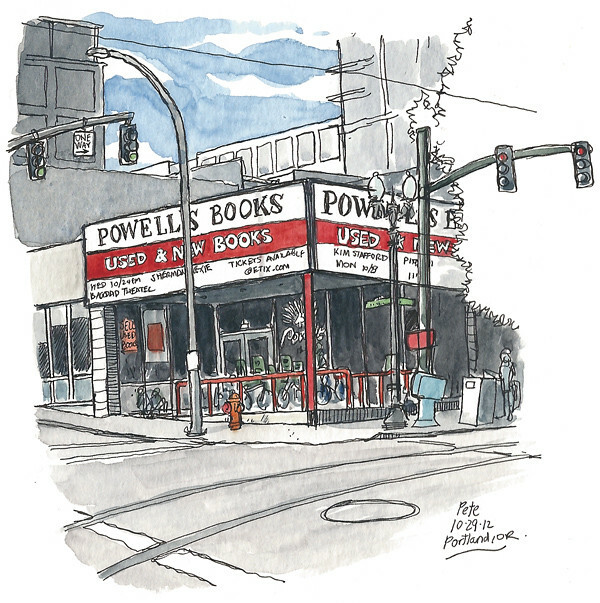 Great sketch of one of our iconic Portland places. Love how you balanced the blue sky and blue newspaper kiosk. But tell the truth…was there really some blue sky that day? 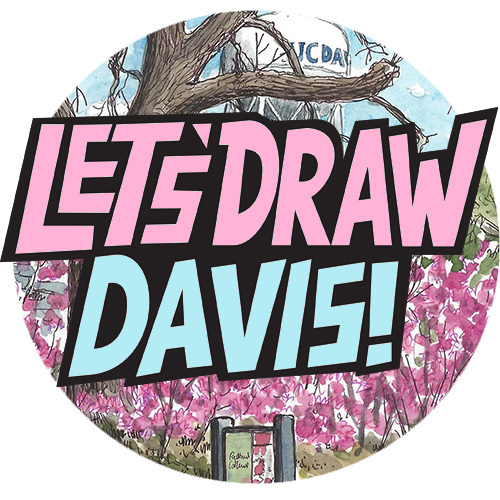 Excellent sketch. Yes, Powell’s is the best ever! I’ve actually been to Portland and not gone to Powell’s as I can not withstand the temptation to buy at least $100 worth of books! I did go when there for the USK Workshop as it was just down the block and pulled me in like a magnet, multiple times. Star Wars section! Yes. After your comment about spending your teenage years in bookshops, I realized that during my entire childhood in the tiny town in which I Iived there was never a bookshop. How tragic. I guess I spent the time in the tiny library.